"Set ye up a standard in the land, blow the trumpet among the nations..."
As a Christian, we are called to be standard-bearers of righteousness, and call all believers to rally for Jesus! We are in a war, and need to lift a signal to our enemies to show what Army we belong to. Mighty is the Army of the Lord! 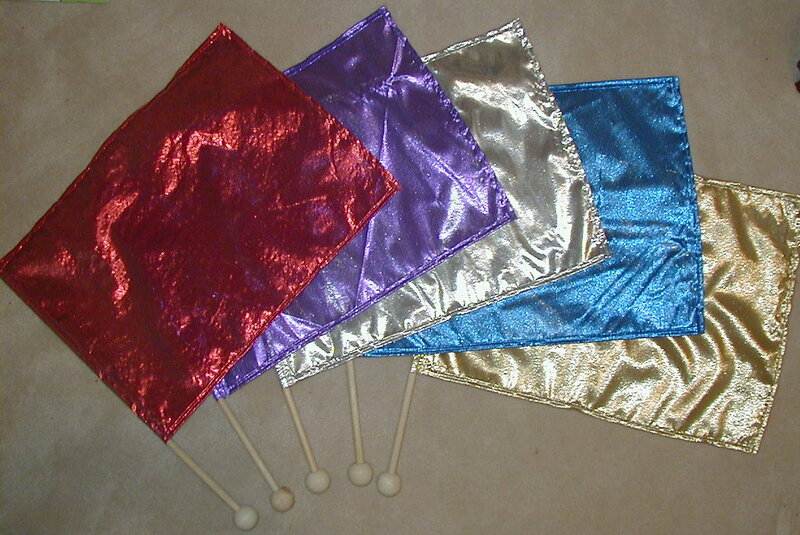 Standard flags are made to fit a 28" baton with a rotating flag shaft so that they free-spin. All free-spinning flags are mounted on a plastic tube via velcro. I personally prefer either the wood or fiberglass shafts over the metal ones for worship because they are much lighter and you are able to change direction of the flags easier for more interpretive movements. Our new fiberglass flag shafts are a nice "medium" weight, in between the light wooden shafts & heavy metal batons, and I like them for warfare or faster-praise ministry because the additional weight allows them to swing more easily. They are also more durable and less likely to break from the more powerful movements used in warfare. flag size = approx. 19" x 27"
All our our items are made specifically for the glory of God, so it is important that each one is prayed over and made with this goal in mind. After much prayer, we have decided not to 'out-source' our items (as some suppliers may do, which would certainly be a lot easier for us! ), but chose to continue offering our 'props' made in-house (except for the glory rings and tambourines). You may pay a little more purchasing it at our site, but know that each are made for a specific purpose... to be used for the purpose of exalting our mighty God. When choosing a flag, it's important to keep in mind the spiritual significance of why we praise the Lord with this 'prop'. The definition of a flag is "A piece of cloth varying in size, color, and design used as a symbol or standard". When we choose a specific color for our worship (with the knowledge of its scriptual significance), we are setting our hearts before God and exhalting His holy name on a spiritual level. available tissue lame colors: scarlet red, royal blue, emerald green, rich purple, medium pink, gold, & silver (please see biblical color meanings on our home page). available china silk colors (100% polyester): scarlet red, royal blue, rich purple, and white. (please see biblical color meanings on our home page). Personal Praise Flags measure approximately 14" x 20" with an added 'twirl' ball on the bottom end to give a finished look and prevent flag from slipping from your hand. They are the perfect size for worship at home or in a smaller sanctuary. They are also great for children's ministries. Each flag is mounted securely on an 18" wooden dowel via hot glue. Personal Praise Flag - $12.99/ea. Initially created to signify God's refining fire in our lives, you can use these beautiful flags as you worship in surrender to God's will in your life. It's only through the "refining process" that we are purified, and become more and more like Him! These "fire flags" are hand-painted on 100% habatoi silk, edged with "Fray-Check" to prevent fraying, and the tips are painted with gold glitter. No two are exactly the same! They come in two sizes: 17" x 36" or 19" x 36". (to fit on 25" or 28" standard flag shafts.) 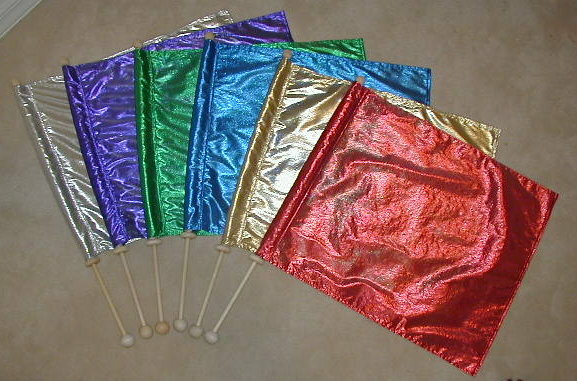 These flags are sold in pairs (flags only for use on metal twirl batons), or as a set on wooden batons w/rotating shafts. They are absolutely beautiful and would make a great addition to incorporate in your worship time. 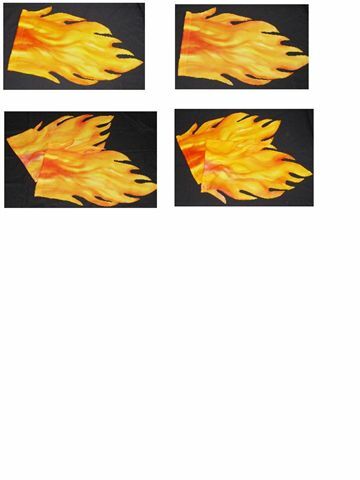 These flags are very similar to the fire flags, and are representative of the Living Water offered to us by Jesus. We are cleansed and made pure by the washing of the Word so that we are able to offer to Him a pleasing sacrifice with clean hands and a pure heart. These flags are hand-painted in blue and green.